We are experiencing the rise of the 'creative thinker.' The modern problem solver who is motivated by getting things done, masterfully. He collaborates with others with a shared goal, but no clear path to get there. That's where creativity comes in. Regardless of industry, innovation requires extended collaboration across the organization through a series of varied and complex activities. But collaboration in the 21st century operates on an entirely new set of principles than organizations are used to. 10,000ft is a company born from the idea that in order to remain competitive, organizations must reject the outdated management practices that have dominated the past century and seek major changes that inspire creativity in their employees. We design software solutions that enable innovation by promoting transparency of an organization’s practices and autonomy over an individual’s process. The result is a motivated, creative workforce driven by shared goals and the desire to create original work. At its core, 10,000ft is a team of designers. Our small team is made up of people from across the globe, but our paths have brought us together in Seattle. Our collective past experience includes industrial design, software development, and architectural design, which has given us first hand experience with the failures of outdated management practices. We realized that when the path to a solution is unclear, an over-prescribed, top-down management system does nothing more than stifle creativity. Our assumption in the beginning was we weren’t alone in this thinking—as it turns out, we were right. Creative thinkers are not task takers. They need the information to make autonomous decisions that keep things going. Increasingly, these workers are changing the business environment. They are demanding flatter organizations and more agile processes. But transforming our work environment is a journey that not only requires the right people and the right vision. You need the right tools. In January 2012, we began work on our first software solution for creative thinkers, 10,000ft. Our hypothesis, which at the time needed validation, was that if we could create tools that enabled organizations to provide the information necessary to engage and motivate their employees and find meaning in the work they do, that extended collaboration would become more effective and allow organizations to realize the full potential of their employees. Our tools are digital representations of our philosophy and vision for the future of work. They are best suited for organizations that have multiple teams and projects, but the principles that inspire them have broader implications. As we continue to iterate and learn, we will continue to find ways to help more organizations unlock potential in their employees. Our goal with 10,000ft from the beginning was to create a 21st century business management tool that represented our philosophy around transparency, autonomy, and effective collaboration. As we worked to define the problem and develop our assumptions, Artefact was our first partner in testing our hypotheses. As a technology product and design consultancy, their organizational philosophy aligned with our goals, and we knew they were eager for a way to push the limits of innovation and collaboration within their team. They were with us along the way to test our beliefs and allowed us see our ideas succeed (and fail) in real time. By April of 2012, we shipped a viable product in beta to further validate and refine our thinking, and in June of the same year brought 10,000ft to market. Our short history has been an avalanche of experimentation and validation, and close interaction with our customers has accelerated our learning curve. 10,000ft is our first test to prove there is a need for engaging technology that supports dynamic organizations. We plan to design other solutions that provide dynamic organizations the opportunity to breakdown outdated business practices and push the limits of extended collaboration. Success of an organization depends on consistently delivering original products and services. By keeping the principles of transparency, autonomy, and a shared sense of purpose at the forefront, we are able to design software that unlocks potential in each individual, thus amplifying the impact of the organization. Each innovation milestone represents our ideals and philosophies brought to life through our software. In January 2012, we began working on our first product, 10,000ft; a strategic project planning tool for a dynamic and distributed workforce. One of the many challenges of collaboration in the 21st century is knowing what your team is working on and keeping all projects across an organization in order. The goal with 10,000ft was to solve these challenges in a way that mirrored the working style of the 21st century. 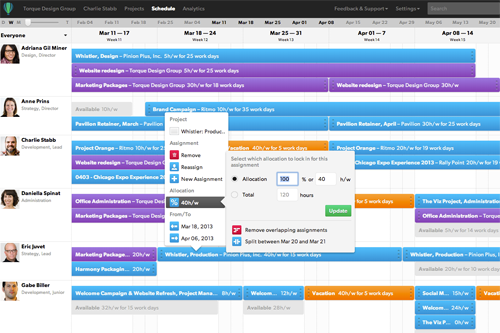 A visual representation of the company schedule is important because it gives the organization the flexibility to adjust an individual’s workload depending on their availability and changes to the project plan. 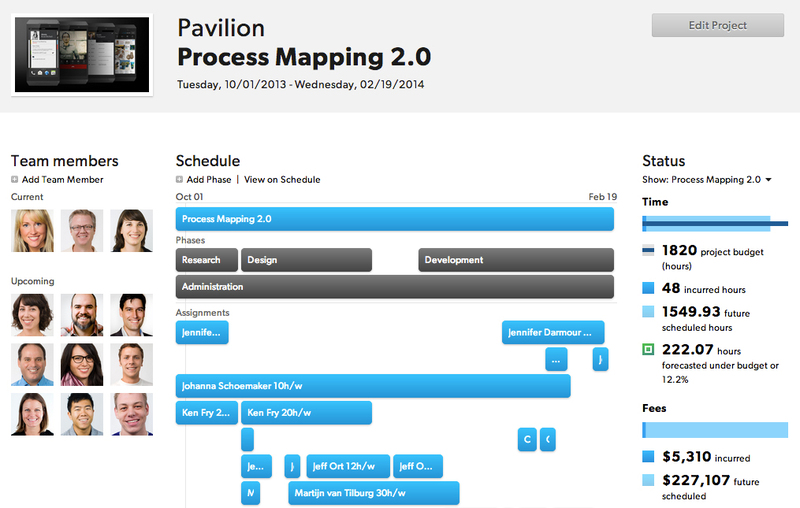 Companies can see when projects begin and when people become available in real time. This information allows teams to be dynamic and adjust the plan as needs arise. Shortly after beginning development of 10,000ft, we rolled out our first prototype to Artefact, a technology product and design firm, to test our ideas. Artefact already had a flat management structure, so a tool like 10,000ft was a natural fit. By working with Artefact in the beginning, we were able to experience the schedule’s effectiveness and the type of collaboration that happens when people across all levels and disciplines have the information they need to make decisions. Artefact’s designers knew ahead of time how much time they had to spend on a certain project and were able to decide the best path to accomplishing their goals. Additionally, 10,000ft allowed Artefact to take their flat management structure further by shifting some of the decision-making responsibility from leadership to the individual project teams. Often, the people who are closest to the project understand the needs of the project better than the managers. 10,000ft was able to take the information that typically only project managers would have access to and share it with everyone on the team. This redefined the responsibility of leadership in a way that promoted Artefact’s flat culture, and was huge validation for our product moving forward. After testing our assumptions with Artefact, it was time to expand our sample size to further validate our assumptions. We released 10,000ft in beta to 20 agencies and consultancies that we thought shared our frustration with outdated management practices. One of our beta testers, a design consultancy in Seattle called General Assembly, was using a complex and collaborative process to create meaningful and successful products for their clients. With multiple people contributing to a project at any given time, the question of ‘who has done what’ becomes all the more important to answer. 10,000ft’s flexible time tracking design gave their team members more of a say in how the project progresses. If they worked according to the plan, confirming their time required a single click. If they worked over or under, that information immediately impacted the project status, which allowed for informed changes to be made to the plan. “It is a tool everyone is happy to use both for inputting their own time, and for understanding the project status in order to make informed decisions quickly,” commented General Assembly after testing. This was an important realization for us. It confirmed that there is value in giving everyone the power to influence the plan. No longer does the project manager make guesses about how the plan is progressing or what the team needs. This information is available for everyone to see. When we started developing 10,000ft, our goal was to launch a minimum viable product by June 2012. After six months of iterating on potential solutions and testing our ideas, we were ready for to take 10,000ft to market. Compared to our product today, the term ‘ready’ was used quite loosely. The product was missing some essential features such as project phases and tags, but we decided that it was better to be on the market and open ourselves up to the feedback and criticism of the industry than to keep 10,000ft hidden. We were confident with our progress and hoped that the philosophies behind 10,000ft would be strong enough to carry us through the launch. We were met with open arms. FastCo Design covered our launch, calling us a simple and beautiful tool for the country’s best design firms. AppStorm rated 10,000ft a 9 out of 10 on their software application review website. We shared our thoughts on innovation and dynamic organizations in places where we thought we would find people who shared our philosophies, such as the Design Management Institute. Our goal was to do more than get word out about our product; we were sharing our philosophy on the modern workplace and our vision for the future of work. After nearly six months on the market, we learned a lot about what it takes for effective collaboration. Every demo, every customer support question, every bug fix, became an opportunity for us to learn about how companies motivate their employees to do their best work and adapt to the changing landscape around them. That is why when PSFK, one of the best sources of new ideas and inspiration for creative professionals, asked us to imagine the future of work, we got excited and jumped to the challenge to develop a concept that illustrates our vision for the workforce and work culture of the future. This design challenge was a chance to apply the learning from our product and our customers to concepts that continue to challenge the management practices of 21st century companies. The concept we came up with is called WorkDNA. 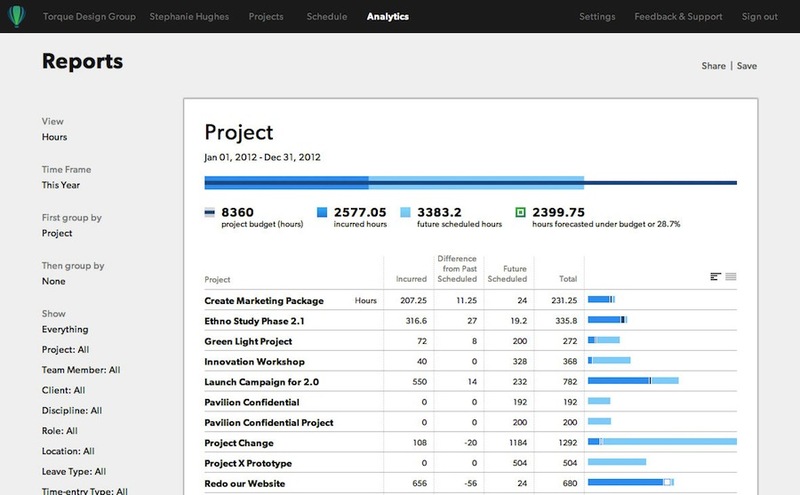 10,000ft is our resource planning and project management tool—the foundation on which creative companies can build a culture of collaboration and transparency; WorkDNA is our vision for a dynamic system of real time, cloud-based modules designed to empower organizations to create a culture of collaboration, transparency and shared goals. TeamDNA, an application that maps the individual profiles of members against the needs of the team to determine if there are gaps that need to be filled or accounted for. Workflow Sandbox, which takes into account the goals of the project and the skills needed to accomplish the project successfully. It maps them back to members’ skills and strengths and helps assign different tasks and phases based on personal passions, strengths and goals. Team Explorer, which kick starts team communication by identifying and alerting you to common professional goals of personal interests, creating a common bond that further facilitates collaboration. The WorkDNA modules allow you to quickly and easily understand not only the technical skills of existing team members but their personal strengths and weaknesses. Currently WorkDNA remains a concept for how we envision enhanced collaboration in the future. It serves as an example of another potential area technology could support the work style of the modern workplace. The major challenge with designing software intended to transform accepted practices is you are met with great resistance from organizations that feel a false sense of security from the way they currently operate. The philosophies that 10,000ft is built upon often challenge what is considered acceptable, and organizations are sometimes slow to adopt. Information sharing is widely viewed as beneficial to an organization’s success, but there is often hesitation when it comes time to actually share financial and budget data with employees. We understand that company-wide transparency is a process, and have built different permission levels into 10,000ft to control what information is shared with whom, but our goal is to prove the benefits outweigh the costs when everyone has access to the right information. Often, organizations ask us to add a feature that goes against our core values. Features that fail to promote dynamic, high-level planning. While it can be tempting to give in to every customer request that comes through, we are diligent about measuring new features against the philosophies that inspired 10,000ft. We are quick to reject feature requests if it seems like we would deviate from these core values. The philosophies that inspire 10,000ft offer changes that any organization can benefit from, and there is no one method to achieving these benefits. 10,000ft is our way of helping organizations realize the impact transparency, sense of purpose, and collaborative decision-making can have on their people. The people working closest to the project are the ones who have the best sense of the project’s needs. 10,000ft puts the power to make changes to the plan in the hands of the team members, not just the project managers. This is a radical idea for organizations that are used to the traditional top-down approach to decision-making. When we started, we were unsure of how the rest of the world would react to this management style. Our key assumption was that other organizations shared our philosophy that a transparent, purpose-driven, and collaborative work environment is ideal for creating a successful workplace, but the changes we were proposing would be completely foreign to some. After releasing 10,000ft in June 2012, it was clear that this assumption was true. When an organization prioritizes making information about the project accessible to the entire company, there is a larger sense of each individual’s impact on the project and organization as a whole. And providing information about a project’s constraints is critical to achieving innovative, original work. Constraints such as budget, timeline, and available personnel need to be accessible from the beginning. Such transparency promotes autonomous decision-making, since everyone can see the impact of that decision on the project as a whole. The Harvard Business Review proclaimed that “meaning is the new money” in the 21st century. That is because workers today need to see value in the work they do, otherwise they will seek it elsewhere. There are a variety of lessons we have learned about how 21st century organizations are changing the world of work and we have applied much of what we have learned to inform our design decisions when we add new features and think about future products. Much of what we have learned applies to how we think about our products specifically, but we can distill certain lessons down to key guidance for organizations looking to implement change immediately, without incorporating one of our solutions into their business. Don’t over prescribe a solution. As is the nature of creative work, there is rarely a defined path to an original solution. Any tool that is meant to support creative thinkers needs to be as dynamic as the organization itself. Managers need to also realize this and adjust their approach. Additionally, there is rarely one solution to a problem. The best way to overcome this reality is to adopt a culture of iteration within your organization. Understanding that a decision can be changed or reversed at any moment allows the organization to experiment with many different options and choose to pursue one direction, only after evaluating many. 10,000ft is designed to be dynamic and account for external influences that will cause changes to the plan. But an iterative culture does not apply to projects alone. Management styles, company policies, and decision-making processes should all be subject to change if deemed necessary. This avoids the potential for a ‘we’ve always done it this way’-mindset, which can stymie productivity. More importantly, companies that have the ability to change directions when their environment changes are better prepared to lead in the 21st century. Transparency is key to breaking down silos. Organizational silos are formed when information is kept hidden from the rest of the company. When that information is important to finishing a project on time and on budget, silos can be detrimental to an organization’s success. That’s why we made the schedule the backbone of 10,000ft. When everyone understands the impact of changes to the plan, people can lobby for more help on a project, make adjustment to allocations, and know when when to say ‘no’ to a new assignment. Additionally, by including budget status on every project, everyone on the team has an understanding of the business side of the organization, and can see the impact of changes, like extending a deadline, have on the project overall. Transparency encourages autonomy and builds trust. When you make your financials open and available to everyone, you create an organization that is based on trust—trust in your employees, trust in your leadership. Team members who trust, and feel trusted by their employers, are more engaged with the organization and are motivated to do better work. Transparency around the constraints of a particular project also encourages autonomy and promotes informed decision-making that keeps the project moving forward. The most elegant solution to a problem is the one that solves as many parts of the problem within the constraints that have been defined. Organizations need to have transparency around those constraints (like budget and timeline) from the beginning if they expect their employees to produce elegant solutions. Share the goal. Having a shared sense of a common goal is the most important element to successful collaboration. Even for distributed teams, which we see more often in the 21st century, people work more effectively when they can see the plan and know how their work contributes to the larger goal. This creates a sense of ownership and purpose around one’s work and a willingness to collaborate more effectively. The key for organizations looking to improve collaboration is to ensure all team members understand the goal you are working towards—either as a company or for a particular project—and show how their work influences the final outcome. FastCo Design: "A project management tool built for some of the country's best design firms"
Harvard Business Review: "Meaning is the new money"
Design Management Institute: "The future of work-- Innovation and the power of dynamic organizations, original work, independent creative thinkers"